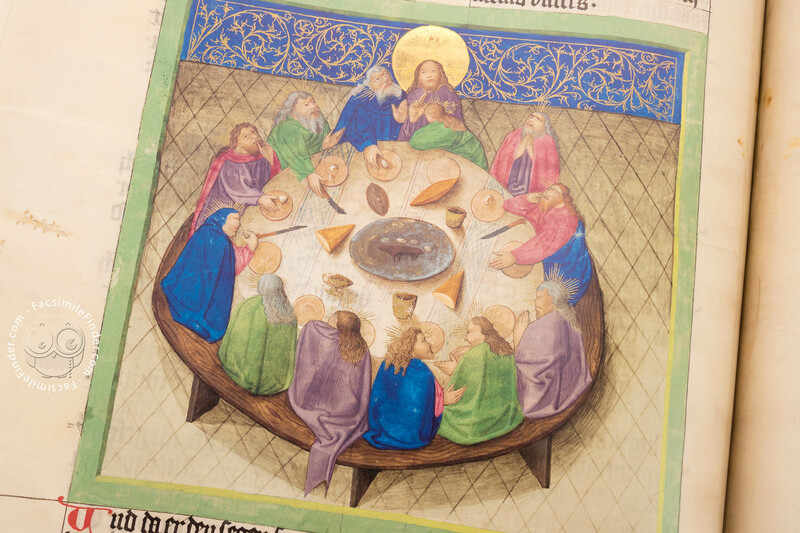 Around the year 1425, an anonymous member of the court commissioned one of the finest German Bible manuscripts in Regensburg. 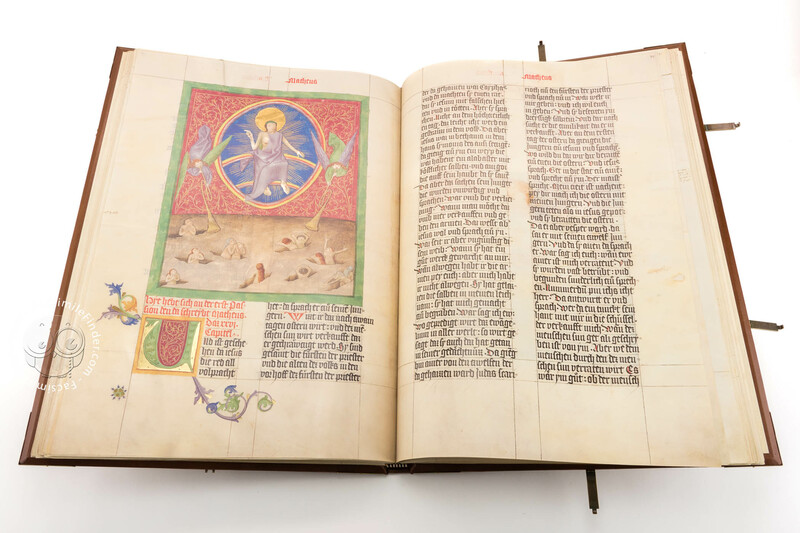 From the 10th century the illuminator's workshops in Regensburg inspired the schools in the Danube region, where monasteries specialised in illustrated luxury manuscripts which still impress us today with their quality decoration. 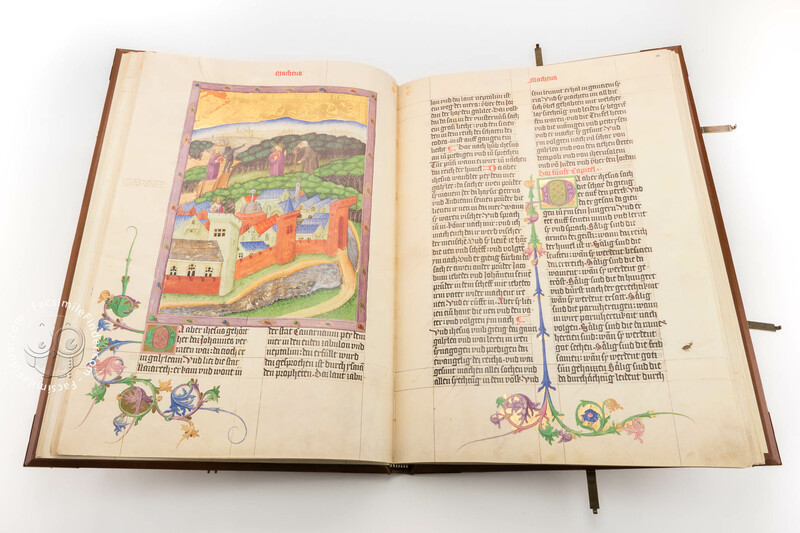 Ottheinrich, the bibliophile Elector Palatine (1502-1559), bought the manuscript around 1530 as a showpiece for his world famous Bibliotheca Palatina in Heidelberg. Thanks to him, this magnificent work of art and monument to the German language has been saved for posterity. 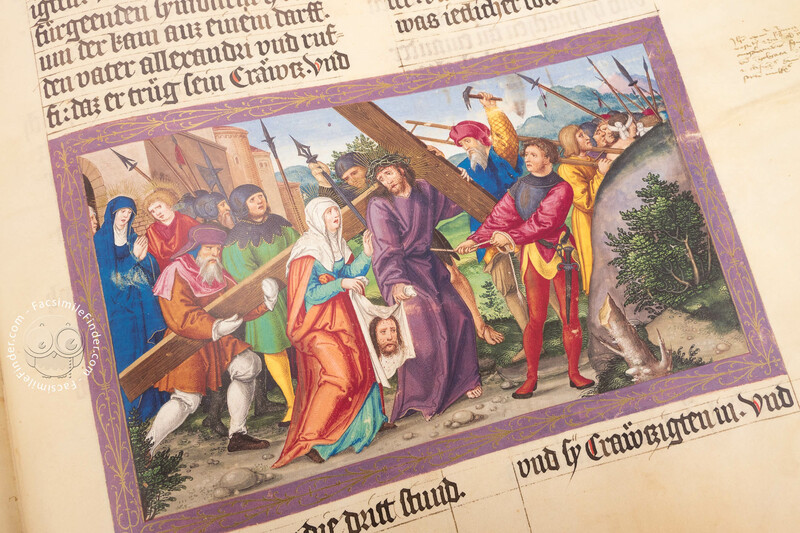 Ottheinrich hired the Renaissance master Matthias Gerung to continue with the decoration of the manuscript and the artist made it into the unequalled and sumptuous edition of the New Testament that we know today. 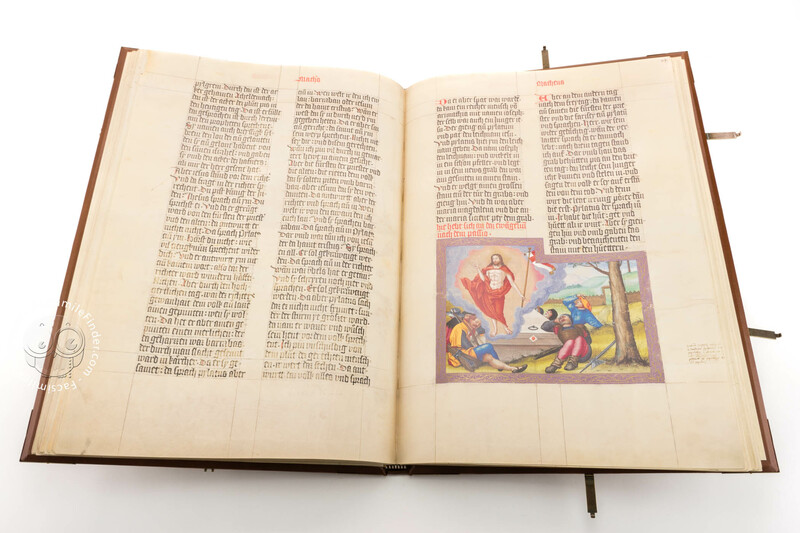 Written in the early High German language, the book can be easily understood by modern readers. 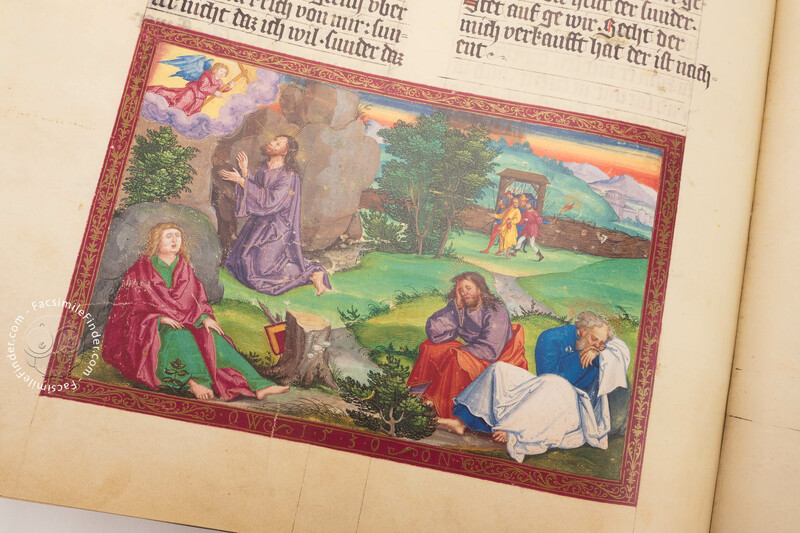 In total, eight volumes containing the New Testament texts in German have come down to us, three of which are now kept in the Bayerische Staatsbibliothek. 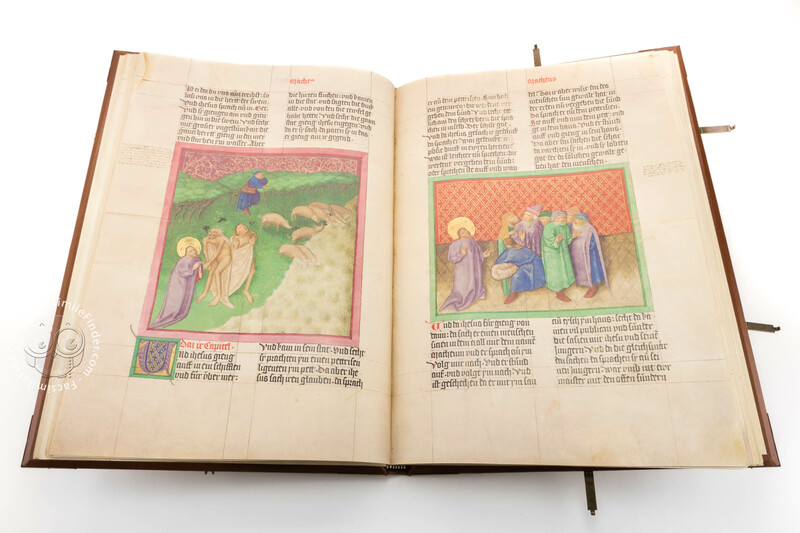 The first two volumes of Ottheinrich's Bible, meanwhile compiled in one volume for reasons of conservation under the shelfmark Cgm 8010/1.2, encompass the Gospels of Saint Matthew and Saint Mark as well as portions of the Gospel of Saint Luke. 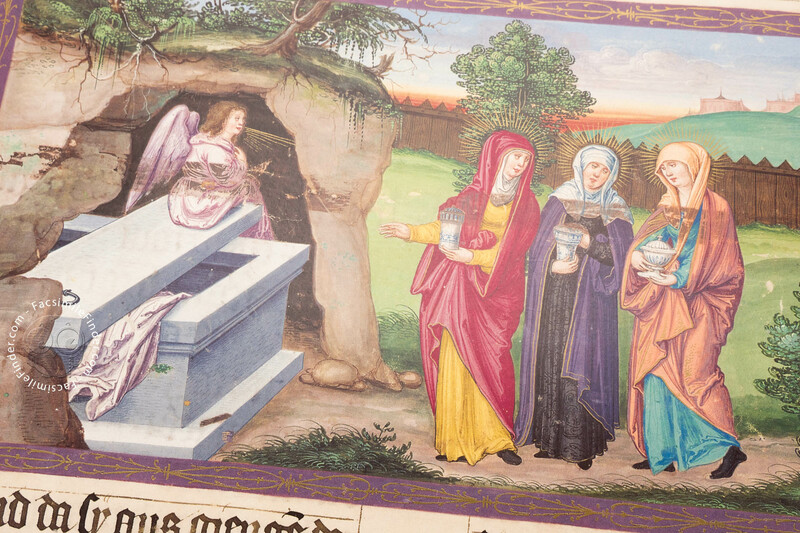 Their importance among the masterpieces of German art cannot be overstated. 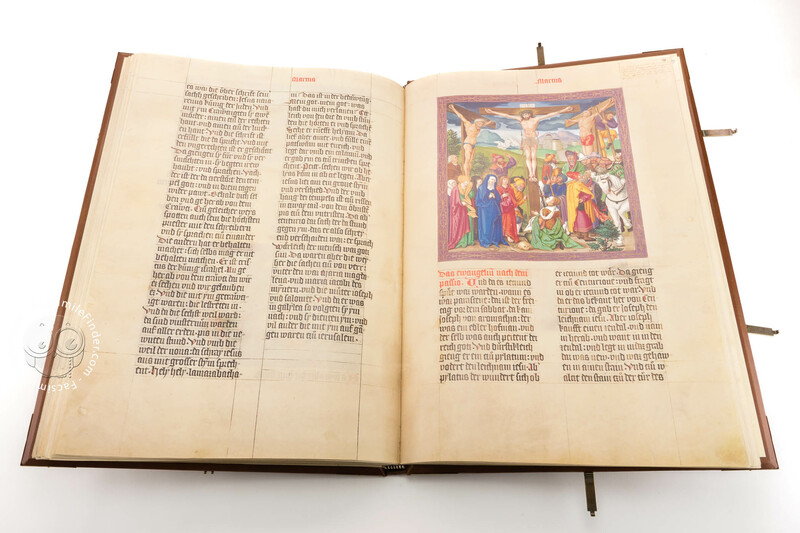 Ottheinrich's Bible is also of the greatest interest in the history of the German language, since it was written at a time when Luther's translation of the New Testament was still 100 years in the future. 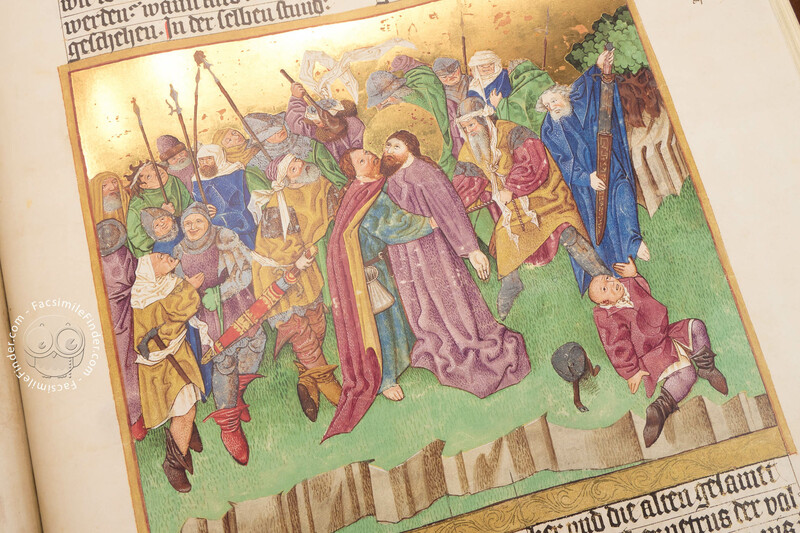 Ottheinrich's Bible is a courtly masterpiece, lavishly illustrated with sparkling gold and precious colours. Whoever commissioned it originally intended more than the simple ordering of a luxury manuscript and must have wished to possess a work representing the culmination of the accomplishments of the most eminent artists of his time. 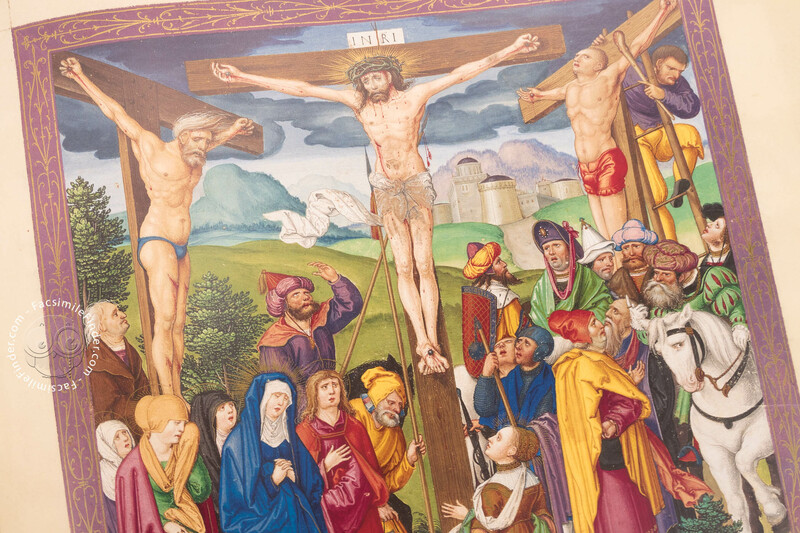 The two principal masters are from the school of the leading Regensburgian artist of this period, the Master of the Carrying of the Cross of Worcester. 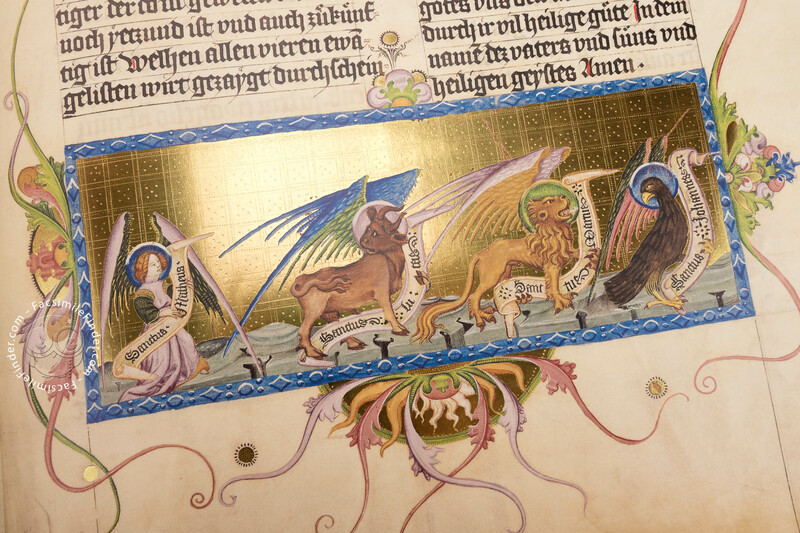 Named after the Gospels from their hands in Ottheinrich's Bible , they are referred to as the Master of Saint Matthew and Saint Mark. 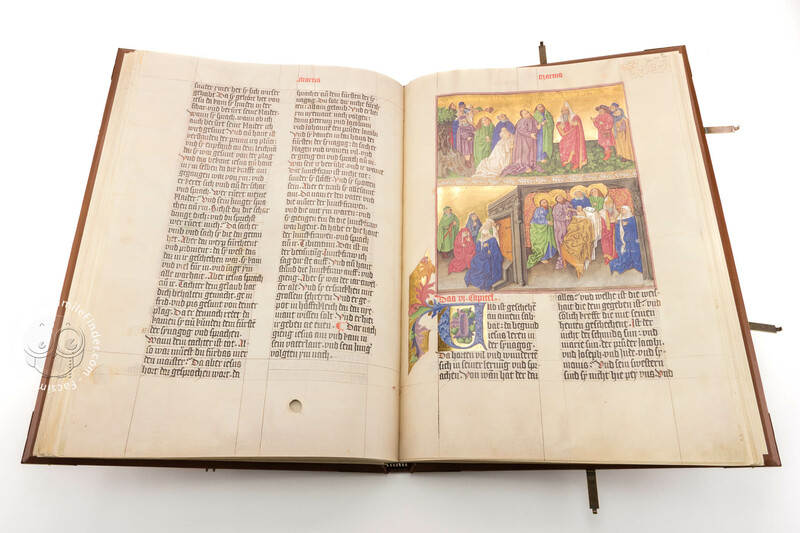 78 folios in the representative format of 53.2 x 37.2 cm are ornate with 46 miniatures on a gold leaf ground, which is additionally decorated with the most exquisite gold chasing. 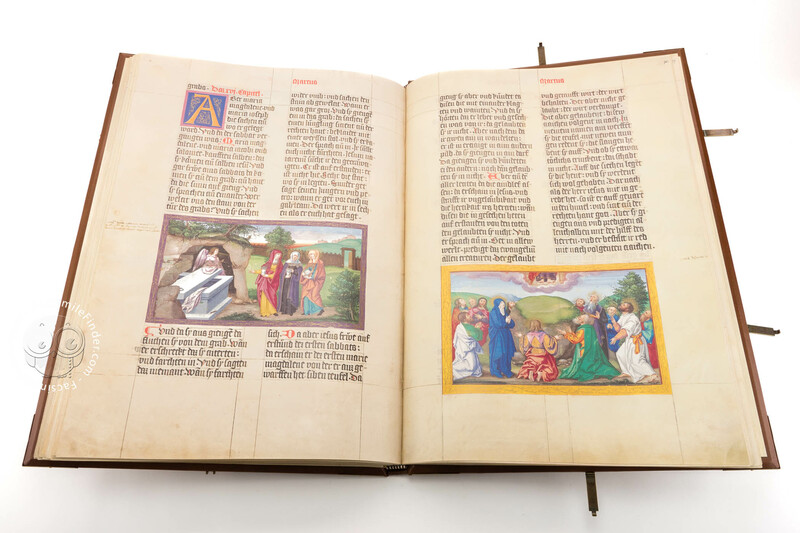 The layout and design of the miniatures frequently covering half a page and sometimes a full page are in the style of panel paintings. 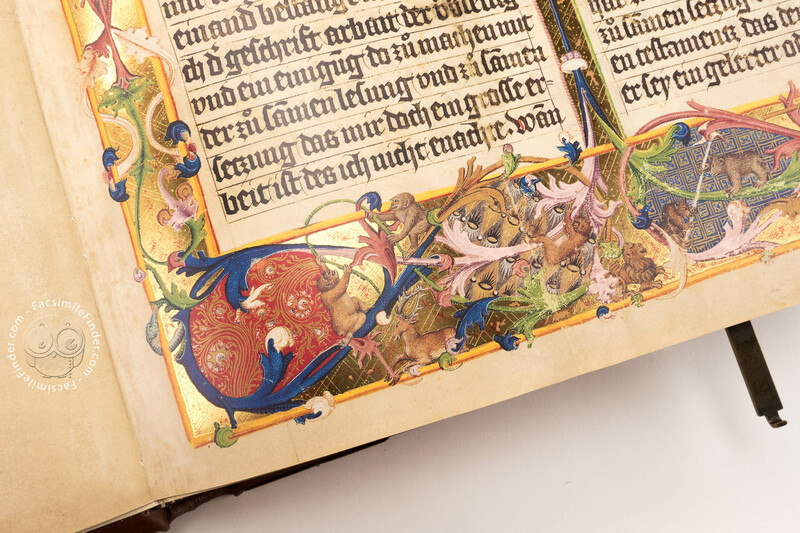 More than 40 brushed gold initials with colourful vines are dispersed throughout the text which is written in two columns. Secular themes from courtly life are hidden in playful details: a stag hunt, a loving couple, a court jester, and all kinds of coloured birds, are found in the decorative scrollwork. 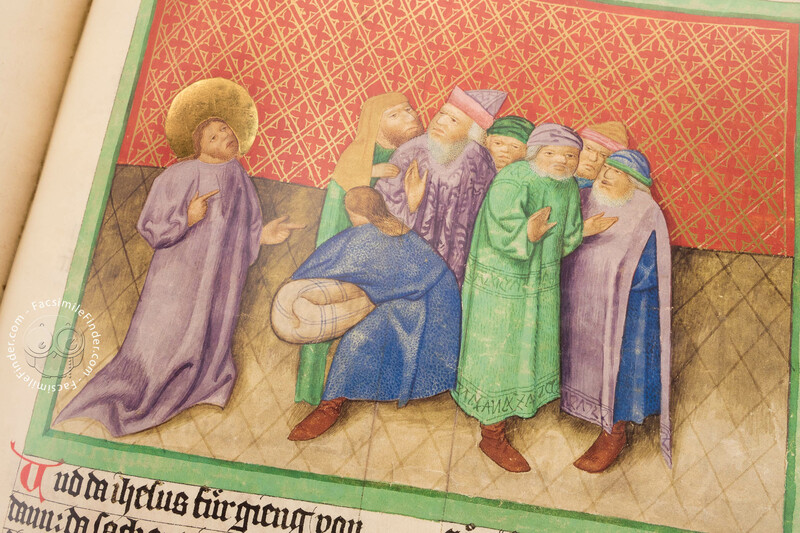 Most miniatures go back to the Master of Saint Matthew whose paintings recall the style of Giotto. His colour pallet comprises violet and grey tones, in order to underline the modelling of figures. The Master of Saint Mark also follows Italian models in his work. A talented storyteller, he tries to animate the scene to be depicted by enlargement and imaginative drama. 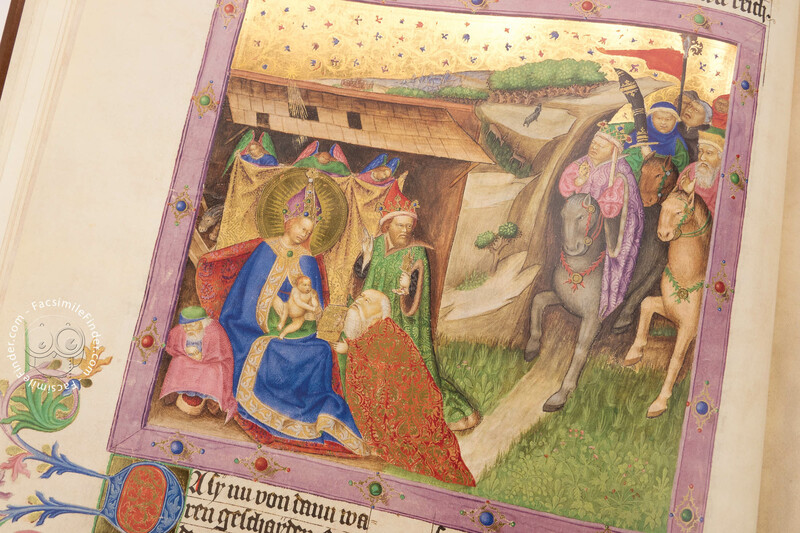 Both painters were active in the same workshop and thus had access to the same Italian models, a rather common situation in Regensburg where masters from Padua and Verona worked together. Although sharing a common stylistic background, both artists, however, developed their individual technique of painting to the utmost perfection. 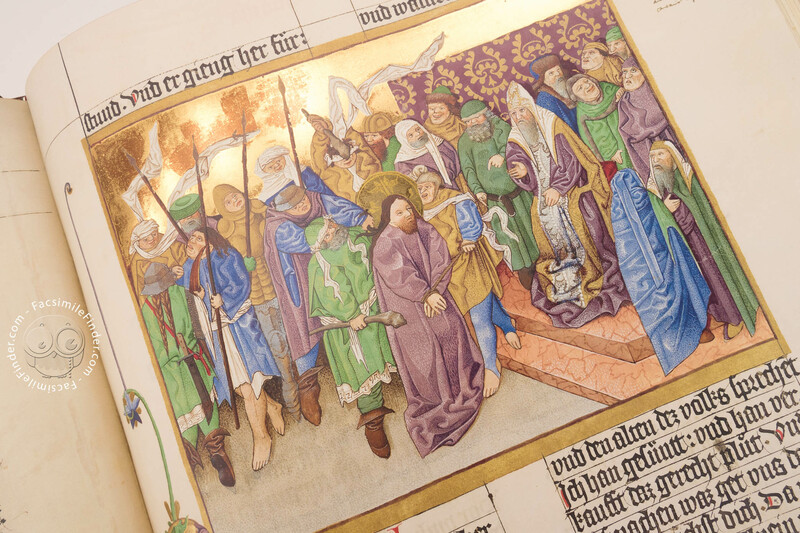 In the course of the conquest of Heidelberg during the Thirty Years War, Duke Maximilian of Bavaria transferred Ottheinrich's Bible to the court library at Munich from where it was looted by Swedish troops and taken to Gotha in 1636. 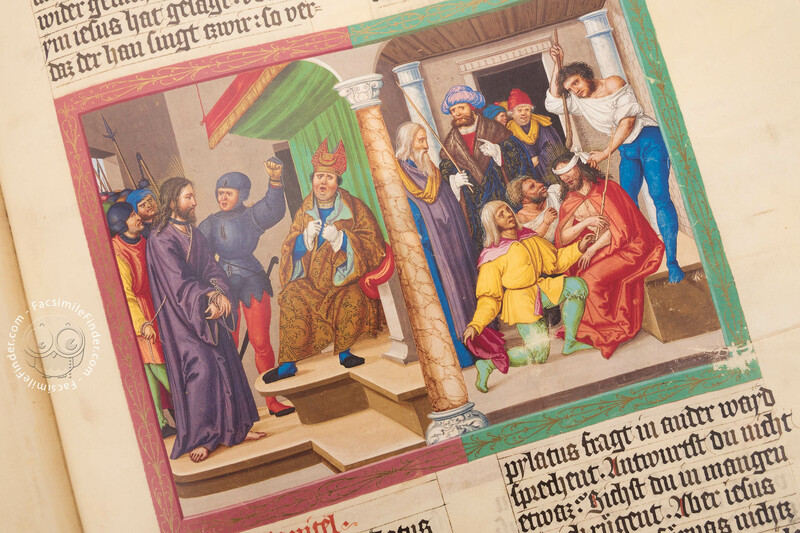 Taken apart and rebound in the late 19th century, five volumes returned to Heidelberg by way of exchange, whereas the Bavarian National Library had to wait until 1950 to acquire the volumes containing the most lavishly decorated Gospels of Saint Matthew, Mark and Luke from a private collector. 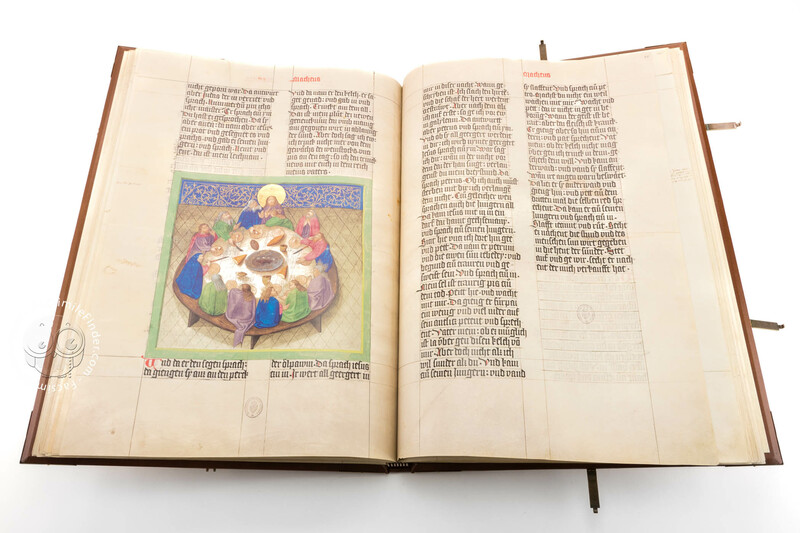 Manuscript book on parchment − 53.5 × 37.5 cm − 616 pp. 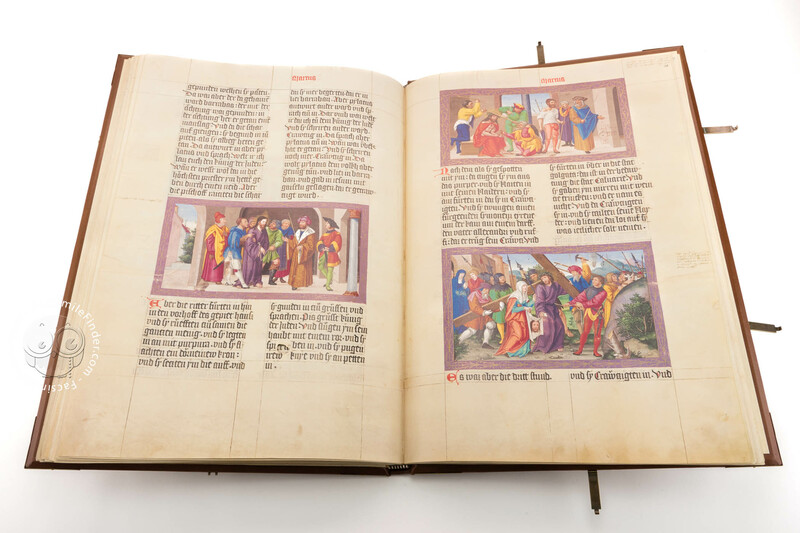 Full-size color reproduction of the entire original document, Ottheinrich's Bible: the facsimile attempts to replicate the look-and-feel and physical features of the original document; pages are trimmed according to the original format; the binding might not be consistent with the current document binding. 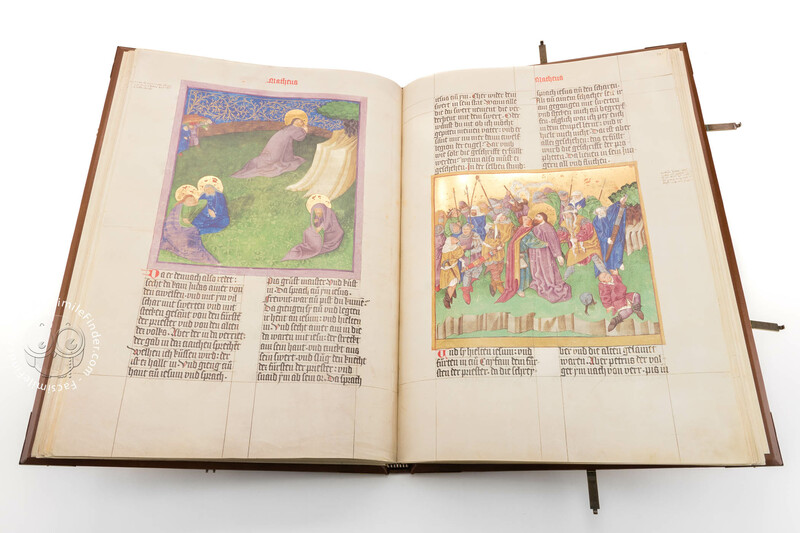 In the making of this facsimile edition, gold leaf, brushed gold and diverse color applications of the original were reproduced employing separate printing processes. 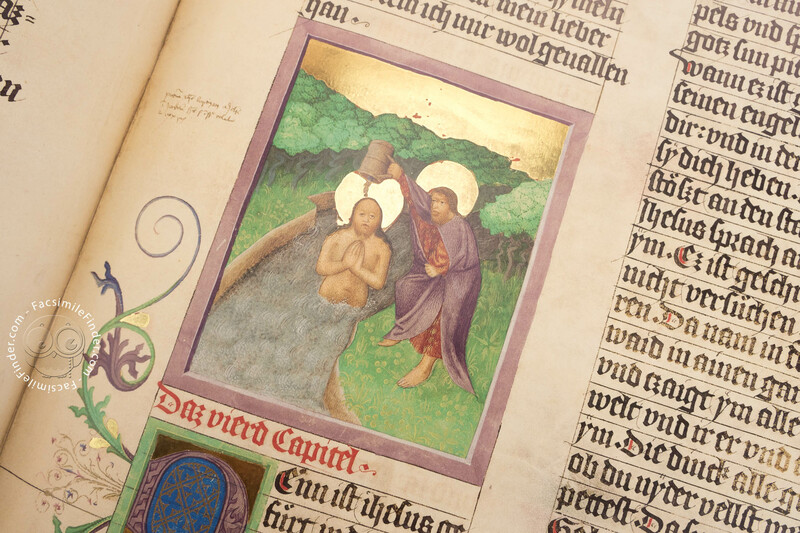 The commentary volume provides access to the original document in all its splendour by submitting the manuscript to an art historical analysis and dealing with the historical background and the linguistic dating of the early High German text. 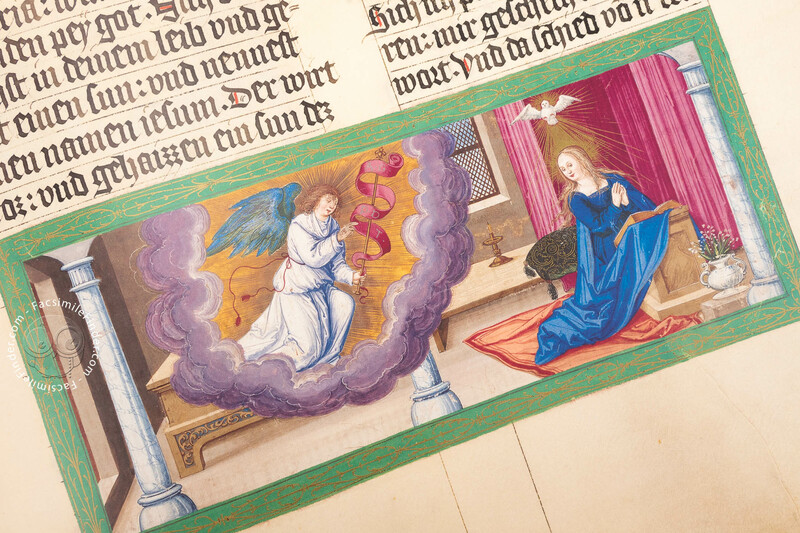 To confer the showpiece in Ottheinrich’s collections the princely aura it used to have, the Bible was given a binding imitating the most expensive deluxe binding ever made for this high-ranking commissioner. 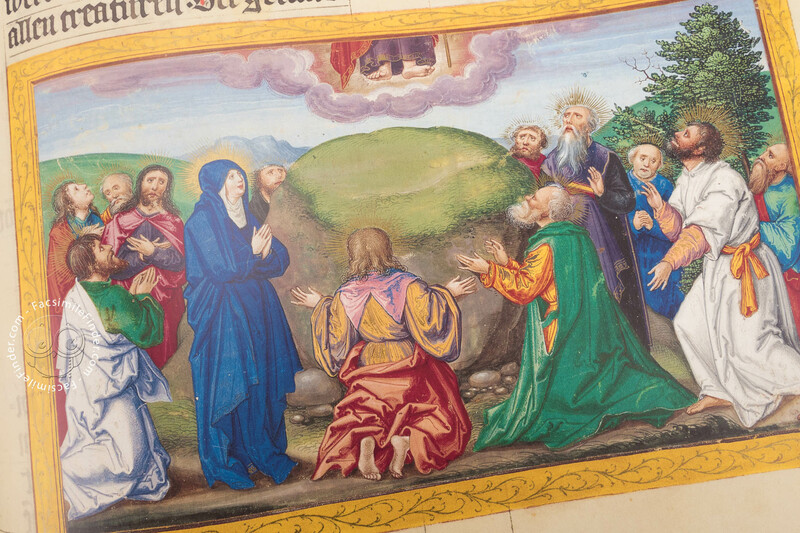 Similar to the one of 1558 (Universitätsbibliothek Heidelberg, Cod. Pal. germ. 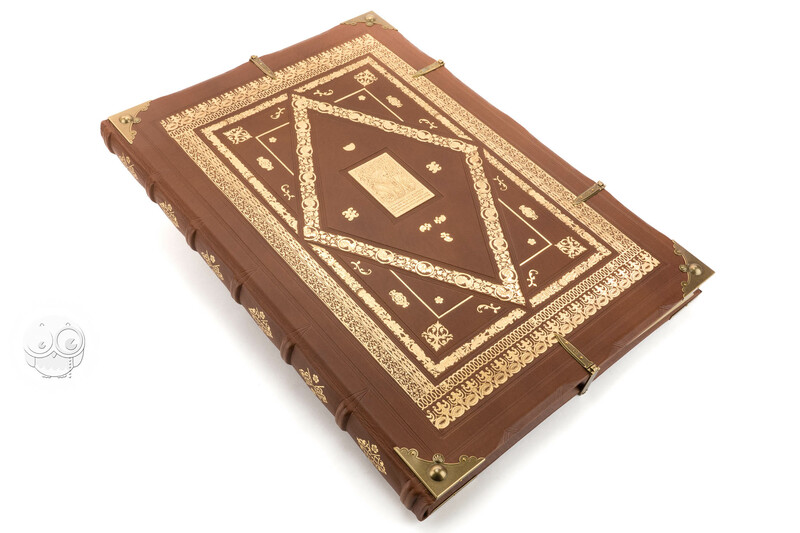 833), the binding of the facsimile edition is decorated with rich gold and blind tooling, eight bosses and four clasps. The front cover shows Ottheinrich’s portrait in gold tooling; the back cover is ornate with Ottheinrich’s coat of arms as Elector Palatine.